Proline = high collagen? low DNA synthesis? Asp/Asn = low proliferation ? high Proline = high collagen? low DNA synthesis? the total sum of glut+gln+pro is the same in both proteins (around 21%). As ribonucleotide reductase requires iron a lack of iron will shift NADPH and Glu use in the direction of proline synthesis. Iron dependent regulation of MDM2/p53 was confirmed ex-vivo in human monocytes, by manipulation of iron pool and in a genetic model of iron deficiency, leading to modulation of p53 target genes involved in the antioxidant response and apoptosis. Gene expression analysis in immortalized mouse hepatocytes exposed to iron or the iron chelator deferoxamine revealed that iron downregulated, whereas deferoxamine upregulated, mRNA levels of mouse double minute gene 2 (MDM2), the ubiquitin ligase involved in the degradation of the oncosuppressor p53. Iron status influenced p53 ubiquitination and degradation rate, and the MDM2 inhibitor nutlin increased p53 levels in iron-depleted cells. A direct correlation exists between iron and p53. Effect of iron status on the MDM2/p53 pathway in human monocytes. A: Effect of iron status on p53 protein levels. Twenty-four hours after plating, after removal of lymphocytes, cells were treated as indicated for 24 hours. Ct: control, untreated monocytes. H2O2 is shown as positive control. β-actin is shown as a loading control. AU (arbitrary units): indicates the p53/β-actin ratio as detected by densitometry. Results are representative of two independent experiments. B: Expression of mRNAs of transferrin receptor-1 (up-regulated by iron depletion), MDM2, p53, and p53 target genes (including Bax, Aldh4a1, Sod2) in monocytes of subjects with C282Y / HH (n = 6, black bars), and subjects with normal iron parameters negative for HFE mutations (n = 6, white bars). *P < 0.05 vs. control subjects. AU: mRNA levels, arbitrary units. C: MDM2 and p53 protein expression, as detected by Western blotting, in subjects with C282Y / HH, and in subjects with normal iron parameters negative for HFE mutations. Three representative subjects are shown for each group. β-actin is shown as a loading control. Deferoxamine (DFO)-induced iron deprivation caused an increase in p53 expression in ML-1 and Raji cells. 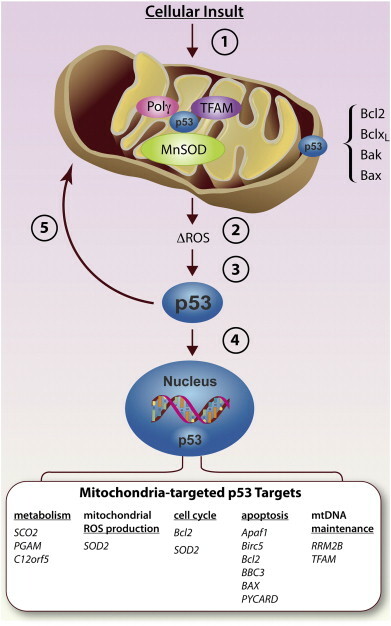 p53 is one of the most mutated tumor suppressors in human cancers and as such has been intensively studied for a long time. 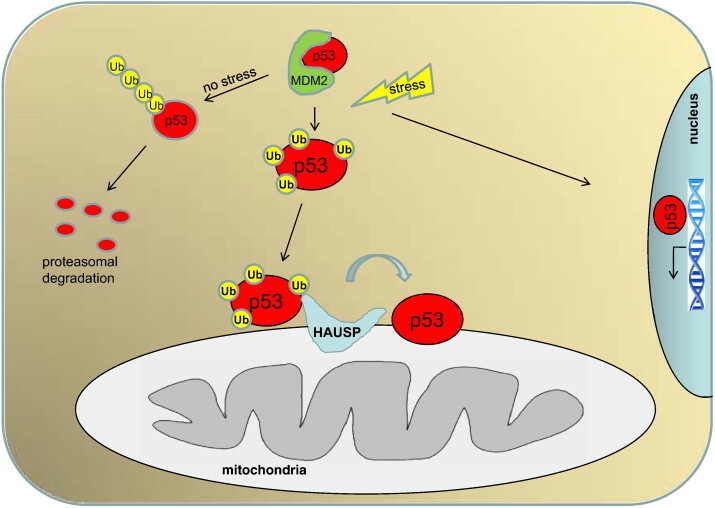 p53 is a major orchestrator of the cellular response to a broad array of stress types by regulating apoptosis, cell cycle arrest, senescence, DNA repair and genetic stability. transcription factor, and numerous p53 target genes have been identified. 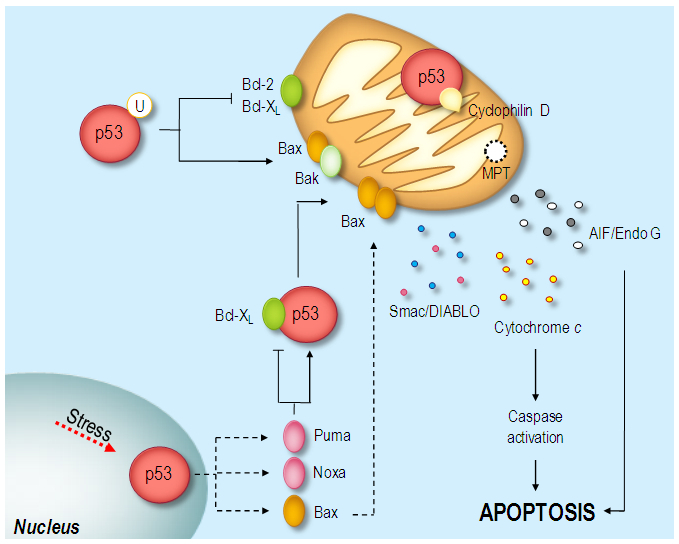 transcription-independent proapoptotic function mediated by the cytoplasmic pool of p53 that participates directly in the intrinsic apoptosis pathway by interacting with the multidomain members of the Bcl-2 family to induce mitochondrial outer membrane permeabilization. 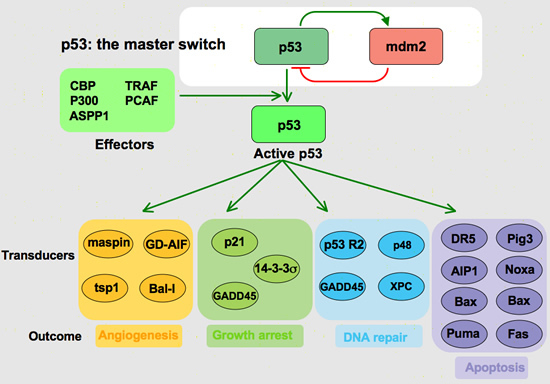 Recent studies have provided relevant and unprecedented information about mechanistic antiapoptotic functions of the endogenous bile acid, ursodeoxycholic acid (UDCA), suggesting that the finely tuned, complex control of p53 by Mdm-2 (mouse double minute-2, an oncoprotein) is a key step in UDCA modulation of p53-triggered apoptosis. We will also review recent therapeutic strategies and clinical applications of targeted agents, their safety, and efficacy, with particular emphasis on potential benefits of UDCA. ATR [? ]/ATM targets are phosphorylated by ATR [?] in response to hypoxia and ATM in response to reoxygenation. Center for Clinical Sciences Research, Department of Radiation Oncology, Stanford University, Stanford, California 94303-5152, USA. The ATR [?] kinase phosphorylates both p53 and Chk1 in response to extreme hypoxia (oxygen concentrations of less than 0.02%). In contrast to ATR [? ], loss of ATM does not affect the phosphorylation of these or other targets in response to hypoxia. However, hypoxia within tumors is often transient and is inevitably followed by reoxygenation. We hypothesized that ATR [?] activity is induced under hypoxic conditions because of growth arrest and ATM activity increases in response to the oxidative stress of reoxygenation. Using the comet assay to detect DNA damage, we find that reoxygenation induced significant amounts of DNA damage. Two ATR [? ]/ATM targets, p53 serine 15 and histone H2AX, were both phosphorylated in response to hypoxia in an ATR [? ]-dependent manner. These phosphorylations were then maintained in response to reoxygenation-induced DNA damage in an ATM-dependent manner. The reoxygenation-induced p53 serine 15 phosphorylation was inhibited by the addition of N-acetyl-l-cysteine (NAC), indicating that free radical-induced DNA damage was mediated by reactive oxygen species. Taken together these data implicate both ATR [?] 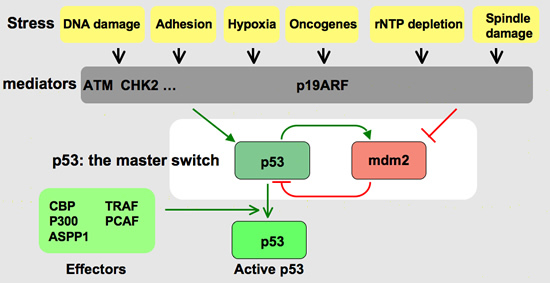 and ATM as critical roles in the response of hypoxia and reperfusion in solid tumors.